Brian Fuata (2015). Photo by Manuela Barczewski. Image courtesy Chisenhale, London. In the middle of the Chisenhale Gallery studio space, seats and cushions are arranged in a circle. It’s not immediately clear what we’ve come to witness this evening, another in the 21st Century Series, but Brian Fuata has done this performance before. That time it was – as he begins by explaining to us – on Sunday, and only five people showed up. One of them was a very handsome scientist, who passed around a bottle of poppers and talked about gamma rays. It sounds too strange to be true, I’m not sure whether to believe him. But this feeling dissipates as he commits to the story – I realise it doesn’t matter whether I believe him or not. Fuata is making sure we know, for the next 20 minutes at least, not to expect empirical truth. Like the five spectators before us, we’re sitting in a circle around him. Unlike the previous performance, however, this iteration is sold out. Whether his story is true or not, the idea of it suddenly exists: there is now a precedent for this moment. Imagining this past semi-identical event, the room suddenly feels very crowded. Although Fuata recounts the previous performance for us forcefully, he is occasionally fuzzy on the details. The story starts to feel like a ritual, as though he is willing it into being. Memories are often somehow tainted by time and uncertainty – but they still inescapably colour our experience of the present. Fuata sets a timer on his phone, then changes into his performance clothes – a white shirt and jeans. After stepping into the middle of the room, he covers himself with a king-size white bedsheet. Suddenly, he is the kitsch archetype of a ghost: the laziest halloween costume or the lowest-budget film extra. It doesn’t matter. Fuata no longer has a face or a living human form. Instead, he has soft, flowing edges. He has less weight somehow. His body is no longer placed firmly in this moment. Some people say ghosts are not real, others have seen ghosts or had paranormal experiences. Either way, we all know ghost stories. Some might argue it’s undeniable that ghosts exist – insofar as we believe them to exist. It seems that for Fuata, ghosts – whether real or imagined – are manifestations of history given a semi-physical form. He is simultaneously believable and implausible as the ghost. The low-budget costume, mixed with a laissez-faire attitude towards verisimilitude, leaves us stuck between two readings. From one perspective Fuata is just a man inside a sheet, lifting up a chair with considerable effort. 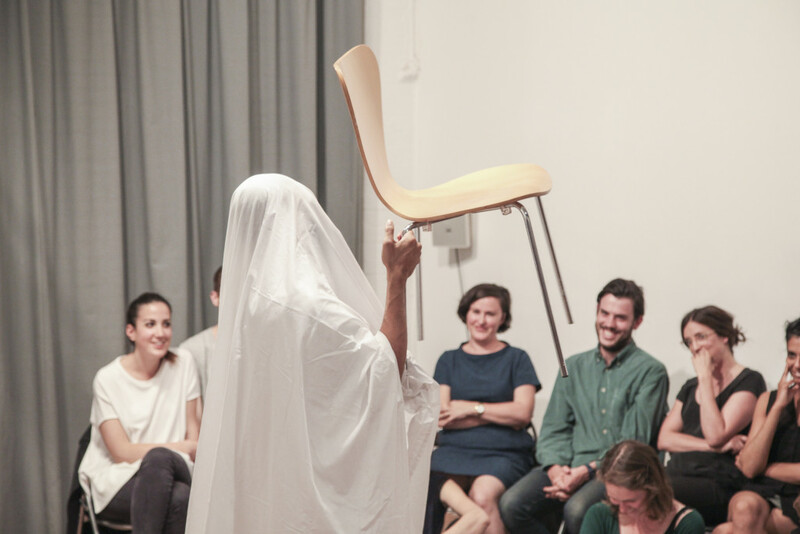 From another, the chair floats in the air, as if possessed. Sometimes he interjects with ghostly noises. They’re coming from the direction of the sheet: from Fuata, or the ghost, or both, or neither. Hunched over, with a gnarled finger poking out of the sheet, he pushes a coin along the floor. Are all ghosts straining and hunching to make objects move in a more ghostly way? 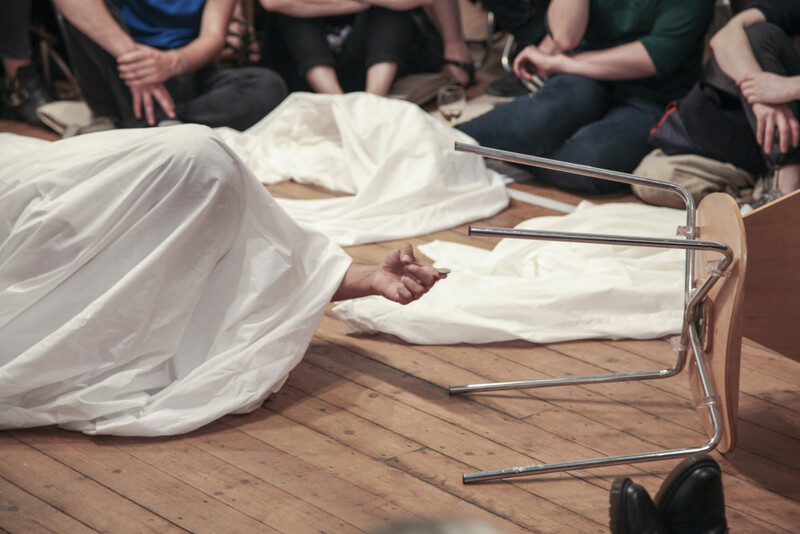 Brian Fuata’s semi-improvisational performance was on as part of the 21st Century Programme at London’s Chisenhale Gallery on July 23, 2015. Header image: Brian Fuata (2015). Photo by Manuela Barczewski. Image courtesy Chisenhale, London.